You’ve seen it on TV, heard it on the radio, partied with it in the hippest clubs, beaches, functions, and within the comfort of your homes. Now, the hottest and trendiest party drink – The BaR – sets its sight in redefining yet another venue to interact with party people all across the country… cyberspace! 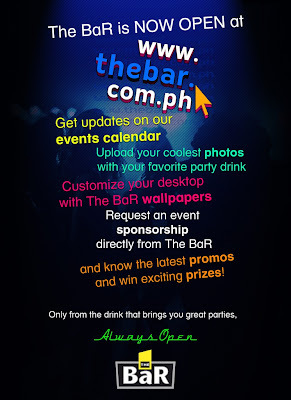 Be sure to log on to www.thebar.com.ph! 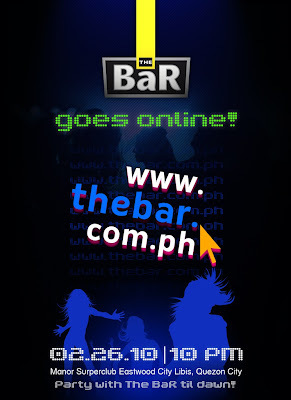 The new official website of The Bar was just launched on February 27, 2010 at Manor Superclub, Eastwood City at Libis, Quezon City. 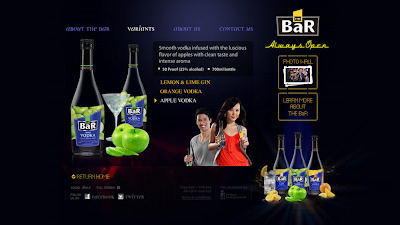 With The BaR being a vanguard in the industry, the launch of their Official Website is another benchmark: a fully interactive online resource on everything The BaR, a partygoer’s gateway to the latest happenings in the metro and the entire archipelago, plus a spot wherein everyone may get the chance to be graced with a party and win cool stuff at the same time. All you need to do is surf and be part of the fun! Imagine, just by logging in, you can find out all there is to know about your favorite party drink and discover what some of the brightest young stars have to say about their unique experiences with it. And if that’s not enough, maybe The BaR could fancy you with downloadable content such as wallpapers, ringtones, and other creative widgets that may complement your digital lifestyle. 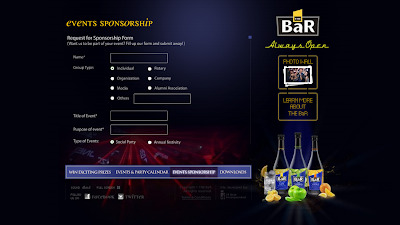 Then with just a few clicks here and there, anyone could follow where The BaR is headed next with their Event & Party Calendar. Be it an event, a bar tour, a college org function, or even your city of locality’s biggest fiesta or celebrations, the parties just keeps getting better! But rather than just scanning though where you’d like to attend, guide your cursor to lead The BaR to your very own event! And for everyone out there who are simply raring to let everyone in the archipelago know how much they “Love The BaR," there is a very special section in the website situated just for you! Show your love by interacting directly with the BaR team via a solid feedback system to let them know exactly what you think, or join in with the online promotions that could get you and your friends premium branded items! Lastly, you could also upload your pictures for you and your friends to browse and grab! “This is our way of giving back to all of our loyal consumers who never let up in supporting us. We plan not just to continue producing the party drink that everyone loves, but to build and maintain strong relationships the fun way as well,” said Mr. Kendrick Tan, Creator of The BaR. Thats a really nice site? Do you know who made it and how I can contact them?